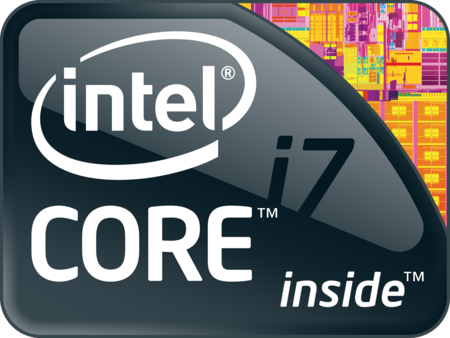 The Intel Core i7 940XM Extreme Edition is a high-end processor the fastest laptop processor at the time of announcement. It features 4 cores (quad core CPU) and Hyperthreading. Therefore, 8 threads can be worked on simultaneously. Because of the Turbo Mode, the CPU is clocked with up to 3.3 GHz in single threaded applications. Using two cores, the CPU can clock up to 3.2 GHz and using all 4 cores, 2.4 GHz is the maximum clock rate. Therefore, even older games (single threaded) should run fluently with this mobile CPU altough the base clock speed is rather slow. The 940XM should provide enough power for all modern games and applications (in 2010). The Core i7 9xx line has an integrated memory controller for DDR3 bars (1066 or 1333).Therefore, the memory performance is very good (compared to older CPUs with external memory controllers). Still this also leads to the higher TDP of the whole chip. Core architecture is still very similar to the one used in the Core 2 CPUs. The power consumption of up to 55 Watt (TDP) is quite high for a laptop CPU and because of the Turbo Mode, the power consumption should reach these high values.